Back home, before a husband, a house, a baby and a real job, I was a happy hour junkie. I still love eating and drinking at happy hour, it's cheap, the food is often fun and the right size, it's early, and if there is outside seating, I'm in seventh heaven! A few years ago in Santa Barbara, there was this restaurant called Chad's that fit all of my requirements for fantastic happy hour. AND it was conveniently within walking distance of my house and my dearest friend's house. AND within walking distance of our work. AND since we both worked in the same mall AND usually the same shift... well you get the idea, we were there a lot. Chad's made a charred artichoke appetizer that was delicious. Toasty and dusted in salt and pepper, charred on the edges and something crazy like $4. Ahhh. Love. When the artichokes are done cooking, remove them from the water and let them rest for a few minutes, until you can touch them enough to slice them in half. With a small paring knife, cut out the hairy center and sprinkle with olive oil and salt and pepper. 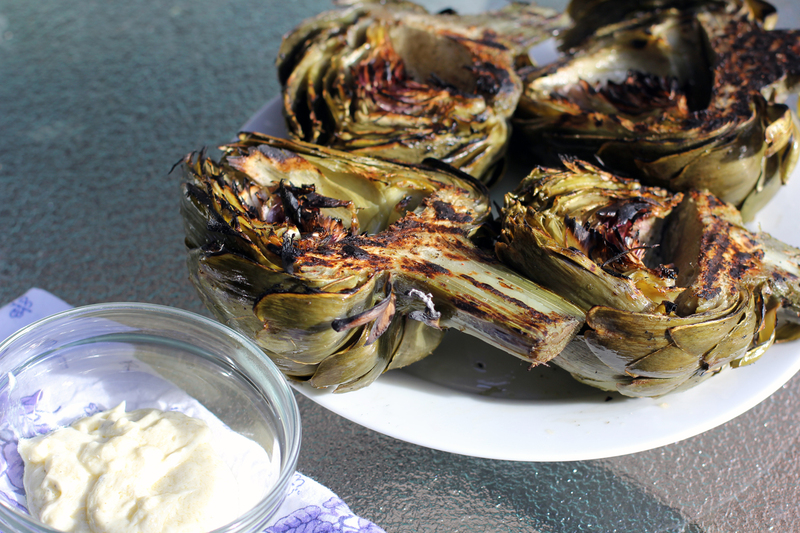 Get your grill nice and hot, and place the artichokes cut side down. With the olive oil, you may get some flare ups, but that's OK. It just adds to the smoky char and it's awesome. Let the artichokes get nice and toasty for about 7 minutes. They are sturdy, so you can check them a bit. Flip them over and grill about 3 more minutes. Chad's restaurant served these with a variety of dipping sauces, I like this light, aioli-ish dipping sauce to go with ours. While the artichokes boil, mix together all ingredients and store in the fridge. The dipping sauce is best if it has a while to rest and chill before you eat it. Baby artichokes work just as well, just adjust your boiling time. You can grill these on a griddle pan over the stove if you don't have, or don't want to fire up the outside grill. You can eat the stem of the artichoke and it's delicious.